Pioneering solar photovoltaic (PV) crowdfunding platform provider Mosaic has opened its largest solar project to date to investors in California. Mosaic is looking to raise nearly $700,000 to fund installation of 487-kilowatt (kW) solar PV array on the roof of New Jersey’s Wildwoods Convention Center. Individual investors are snapping up opportunities to invest directly in solar PV projects via Mosaic’s online marketplace. Mosaic’s most recent solar PV project – a $152,700 loan to install a 114-kW solar PV array on top of the Ronald McDonald House in San Diego – sold out in less than six hours. In addition to helping the charitable foundation create clean energy and save money on electricity bills, the loan yields an estimated 4.5% return to investors. Located on New Jersey’s southern shore and within a day’s drive of one-third of the US population, the Wildwoods Convention Center has hosted more than 1 million visitors since opening its doors in 2002, according to a Mosaic press release. Open only to California investors, Mosaic’s solar rooftop investment opportunity coincides with Earth Week 2013 celebrations. The project to install a 487-kW solar array on top of the convention center is expected to provide 24% of the facility’s electricity and reduce its carbon dioxide emissions by 179 tons annually, the equivalent of 387,500 vehicle-miles not traveled. Mosaic launched its first three crowdfunded solar PV projects in January. Public response was dramatic, and positive – they all sold out in less than 24 hours with Mosaic raising more than $300,000. Mosaic followed that up by partnering with Standard & Poor’s, DuPont, and Distributed Sun to launch the truSolar working group, which aims to lower the cost of capital for solar PV project development by standardizing risk assessment and developing a credit score for solar projects. Mosaic’s community of over 1,000 investors will have financed nearly 1 megawatt (MW) of clean, renewable energy capacity once the Wildwoods Convention Center solar PV project is fully funded, Mosaic’s Michael Parks notes on the company’s blog. 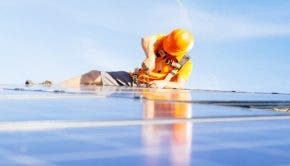 Spread over 12 rooftop solar PV projects in Arizona, California, and New Jersey, it will also put the amount of capital raised at over $2 million. That’s over 73,710 square feet of solar PV panels (1.25 football fields), enough to power around 95 average US homes, reduce carbon emissions the equivalent of taking 176 cars off the road per year, or planting 21,638 tree seedlings, assuming they grow for ten years, Parks adds. In the following video, Mosaic’s president, Billy Parish, talks about the fastest way to get to 100% clean energy.